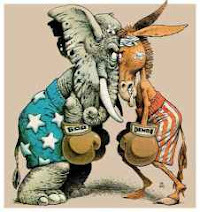 (...) At the outset of October, the 2 biggest fears among rank-and-file House Democrats are that, 1) the DCCC squandered their September opportunity to preemptively discredit GOP challengers, and, 2) Republican outside groups are finally for real and set to deluge the airwaves. In all of September, the DCCC spent just $4M in 25 districts, not even close to a tenth of what the committee will eventually shell out to defend its vulnerable members. Meanwhile, for all the yearlong talk of Republicans' financial inferiority, the NRCC spent $5.9M in September on 31 districts, outpacing their Democratic counterparts. More frighteningly for Democrats, this past week's FEC reports show that 5 GOP-affiliated outside groups have laid down a combined $17.9M in 50 Democratic-held House seats, more than making up for the vaunted cash edge the DCCC has enjoyed over the NRCC all cycle. For most of this cycle, the buzz had Republican-leaning outside groups spending their millions on Senate races and forgoing most House contests. But so far, outside spending geared toward helping GOP House candidates is far outpacing the $5.6M the Karl Rove-advised American Crossroads has laid down in Senate races.